René Magritte titled this painting, completed in Carcassonne in 1940, "Le mal du pays". The standard English translation is "Homesickness." There has been no end of discussion of what the artist intended. I applaud Magritte's own response to those who plied him for explanations of his paintings. He said, "People who look for symbolic meanings fail to grasp the inherent mystery of the image. No doubt they sense this mystery, but they wish to get rid of it." I feel the same way when people ask me to explain my poems. What seizes me in this image is not its strangeness but its absolute familiarity. I have been on that bridge in my dreams, sometimes as the winged figure, sometimes as the lion, or as both. I feel I was at a place like this before I agreed to come into the world, this time. Feeling what it will be like to be down there, yearning for the home of my spirit. As I write these words, I hear again the high, keening voices in the procession of the birth-funeral that I walked before I came into my present body, and I am filled again with yearning for those I love on another plane of being. My personal title for this memory-dream of the winged spirit and the lion on the bridge above the world is, "You'll be missing home." If you want someone to interpret your dream, make sure he can tell it to you before you tell him. I am playing with this fresh aphorism because of an interesting comment on my recent post "The Bazaar of Dreams". A Turkish friend recalls that her grandmother used to take her dreams to a Şeyh (shaykh) of the Halveti Ussaki sufi order for interpretation. On one occasion, the Şeyh greeted her by telling her the essential content of her dream before she had told him the dream. She was shocked, but also convinced that the Sufi master was the right interpreter, if he could find a dream before she gave it to him. This kind of thing is not unusual in cultures where the practice of dreaming is still strong. That the best dream interpreter is one who can tell you your dream before you tell it to him is a sound principle, when you think about it, because it suggests that such a person has great intuitive abilities, and maybe very useful connections on the other side of ordinary reality, and perhaps the ability to dive into the dream world - or at least your own energy field - at will. I have written about the practices of a West African tribe who believe you can only trust an interpreter if he can tell you your dream before you tell him. I have also suggested (in my Secret History of Dreaming that Nebuchadnezzar was operating by the same principle when he challenged all the dream interpreters to tell him a dream he claimed to have forgotten. In a society that valued dreams highly and had advanced dream practices, I'll bet the king had not really forgotten his dream, but rather wanted to put the supposed dream experts through their paces. Daniel, famously, was able to access the king's dream and tell it to him because he had powerful assistance; he called on his God. Let's be clear. This is not a pitch for dream interpretation. We want to help each other to claim the power of our own dreams. We do that by offering commentary by saying "if it were my dream", recognizing our own projections and encouraging the dreamer to accept or reject feedback according to their own instincts. When we are able to enter another person's dreamspace - as shamanic dreamers learn to do, with permission - we can say, "in my dream of your dream," again leaving final decisions about the dream to the dreamer. However, if you are going to look for a dream interpreter nonetheless, look for someone who can find your dream before you tell him what's in it. Nebuchadnezzar's dream of the composite statue. France, 15th century. I am in a marvelous space, with curving arches and columns under a high ceiling. Some long tables run across the hall, as if waiting for market vendors to display their wares, but this space has been cleared for me and a group I am leading in an adventure in active dreaming. Through a rounded doorway I see people walking in a busy, sunny market street. I am happy to be here, in this Bazaar of Dreams. With me are some entrepreneurial women who are doing a great job of organizing the program and want to help me find ways to bring my teachings to many more people. One of them tells me she wants to introduce me to a woman friend "in shipping" who can help to send out my message - that through dreaming we can wake up to our place in the multiverse - in many new directions. We are gathering for the last morning session of my workshop. I greet people in several languages, in French and Spanish and possibly Turkish. With formal respect, I salute an elder of this city who has honored me by his presence. He is a tall, elderly man with a white mustache, slightly stooped, formally dressed in a suit of an interesting color; orange more than brown, his suit is the color of old bricks. Before the group is fully assembled, I deliver an impromptu lecture about dreams in the history of world religions. I observe that many, if not all, religions, are born and grow through dreams and visions, and that most of them continue to acknowledge the importance of dreams, at least in theory. The problem is that religious authorities tend to say, "We will tell you what your dreams mean." This is a problem, also, with spiritual orders, even the most enlightened. I must tread cautiously now, because I know that many of those present are sympathetic to the Sufis, and we may even have a Sufi shaykh in our midst. Nonetheless, I must explain that in my school - as in the dreamwork movement in general - we do not hand over our dreams to any authority for interpretation. We can say to each other, "If it were my dream, I would think about such-and-such", but our purpose is make it clear that dreams belong to the dreamer, not the guru, the shaykh, or the supposed expert. "Our task is to help each other to become authors of meaning for our dreams and our lives." Feelings: Happy, filled with a sense of expansion and creative possibility. Reality: Once again, I see that my dream self is at least as active as a teacher as my waking self, and covers even more geography. My dream self speaks the same way I do in regular life; see, for example, the chapter on "Divine Dreams" in my Secret History of Dreaming. I am interested in Sufi approaches to dreaming, and have studied and written about the great medieval Sufi explorers of the imaginal realms, Suhrawardi and Ibn al 'Arabi, as well as Rumi. Over several decades, I have had an ongoing realtionship, in a parallel reality accessed through dreams and visions, with certain "princes of the East" who seem to carry the wisdom of ancient Persia. I have studied the history of dreaming in the Islamic world, especially under the Ottoman empire, where dreams were assigned great importance, but were often taken to the shaykh (Şeyh in Turkish) for interpretation; even sultans did this. My dream could well be a rehearsal for a future teaching situation. Question: Who is the elder in the brick-colored suit? Is that color significant? Action plan: remember to show respect for different cultures and the elders of different traditions. Due diligence: I recorded this dream in my travel journal on January 12, but only got round to typing it up now. Simplicity is great, and it has a price. We start out with the simplicity of children, but lose that, almost always, and get caught up in the confusion of the modern world with all its contending streams of data and theory and distraction. To become simple again is a gift that requires some degree of mastery and integration, whether the theme is a single subject, or a whole life experience. I am seeking simplicity in my understanding of the psychic storms and mythic dramas in 1987-1988 that led me to transform my life and eventually to follow the path of a dream teacher, for which there is no career track in Western society. I had no external mentor in this period. But there were three books, beyond the others, that helped me to construct a working model of understanding for my experiences, and made me know that I was by no means alone in my depth encounters with life in the multiverse. I wrote recently about the first of these books, a collection of essays on shamanism and art titled Stones, bones and skins. The second was Jung's Memories, Dreams, Reflections. 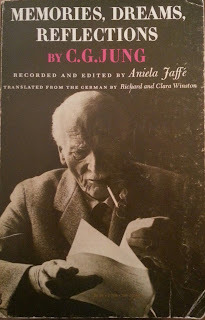 I discovered Jung in high school and devoured many volumes of his Collected Works when I was an undergraduate, though I probably failed to digest the most difficult passages. In the midst of the psychic storms of 1987-8, I turned to Jung again, to see how he made sense of his own "confrontation with the unconscious". My main source book was Memories, Dreams, Reflections, his life story as recorded and edited by Aniela Jaffé based on conversations he began when he was eighty-one. His great life crisis began in 1912, after his break with Freud. For several years, he lived in a house of the spirits. The contents of his dreams and visions seemed to be spilling over into his physical life, producing poltergeist-like phenomena and apparitions that his children could see. Night after night, he descended into a dark and thrilling Underworld where he met mythic characters who seemed to him to be entirely real and transpersonal. He often felt he was under an avalanche of psychic events, "as if gigantic stones were tumbling down upon me." His survival required him to draw on a "demonic strength" that brilliant, mad Nietzsche had lacked. He kept seeing patients, but stopped lecturing at the university and ceased publishing for three years, no longer confident that he could make sense of things for other people. He had no mentor now, in the ordinary world. He sought stability through his family, his continuing work with clients, through painting and through "hewing stone", building a miniature stone village that he thought he was making in collaboration with his eleven-year-old self. He realized that he had to reclaim beginner's mind. He said to himself, "Since I know nothing at all, I shall simply do whatever occurs to me." Then he took the shaman's plunge. "I consciously submitted myself to the impulses of the unconscious." Central to Jung's ability to restore his inner compass was his daily recording of dreams. Now divorced from theory, his main preoccupation was to set down an unedited, uncensored chronicle of his experiences. "Dreams are the facts from which we must proceed." 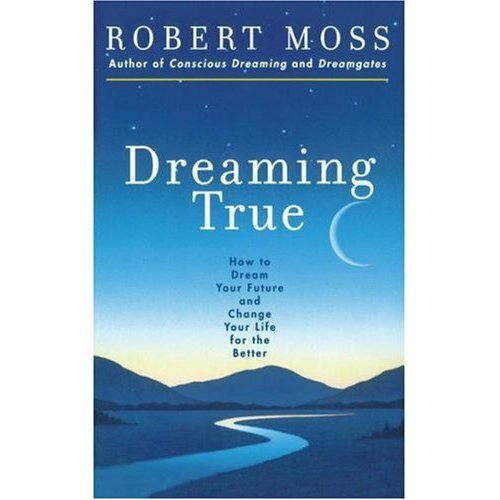 This was one of his central discoveries, and it is one of the most helpful statements that has ever been made about dreams and dreamwork. Let's start with the facts of the dream, leaving aside theory until we have recovered as much of the experience as possible. This was confirmation for me of the method I was obliged to improvise in my own time of testing. I journaled my dreams and visions as exactly as possible, giving each a title noting the time and duration of each experience. I most required clarity when my experiences rebuffed interpretation and linear thinking. I found it essential to disentangle the reports of inner adventures from other material so that their nature and content was not blurred. I underlined Jung's statement that "otherwise the material would have trapped me in its thicket, strangled me like jungle creepers" and put a big check mark in the margin. Exactly right. In his storms of emotion, Jung sought to let images take form. Images gave him a way to work with the raw power of emotion rather than being torn apart by it. He was learning how to harvest images and rework them through what he later called "active imagination" in the laboratory of his own psyche. He recorded the facts of his inner experiences even when he found the content nonsensical, repugnant or freakish. In this way, he hoped that instead of being drowned by the contents of his inner life, he would gain a means of navigation. He felt himself pulled into the Underworld. Instead of resisting, he let himself drop and began a harrowing journey of Underworld initiation, played out over years rather than hours, reminiscent of the shaman's path of tests and ordeals. In this time, he found an agreed form for an inner guide: an old man with the horns of a bull and wings of kingfishjer blue that he named Philemon. "It was he who taught me psychic objectivity, the reality of the psyche." Near the end of his life, Jung observed that "all my works, all my creative activity, has come from those initial fantasies and dreams which began in 1912, almost fifty years ago. Everything that I accomplished in later life was already contained in them, although at first only in the form of emotions and images." He had had a plan for his life, to become a professor and pursue a scientific line that had seemed clear to him. "But then, I hit upon this stream of lava, and the heat of its fires reshaped my life." What overthrew his plans and expectations also gave him the prima materia for a greater life work. "That was the primal stuff which compelled me to work upon it, and my works are a more or less successful endeavor to incorporate this incandescent matter into the contemporary picture of the world." On my own stormy path of initiation in 1987-1988, I felt immense affinity for the great shaman of the West who spoke those words, and took comfort and courage from his example. I felt the deep truth of his ringing assertion that "he who takes the sure path is as good as dead", and spoke those words aloud, as I walked with my dogs to the old white oak behind the house, and scrambled up the slippery banks of the creek to the highest of the waterfalls. 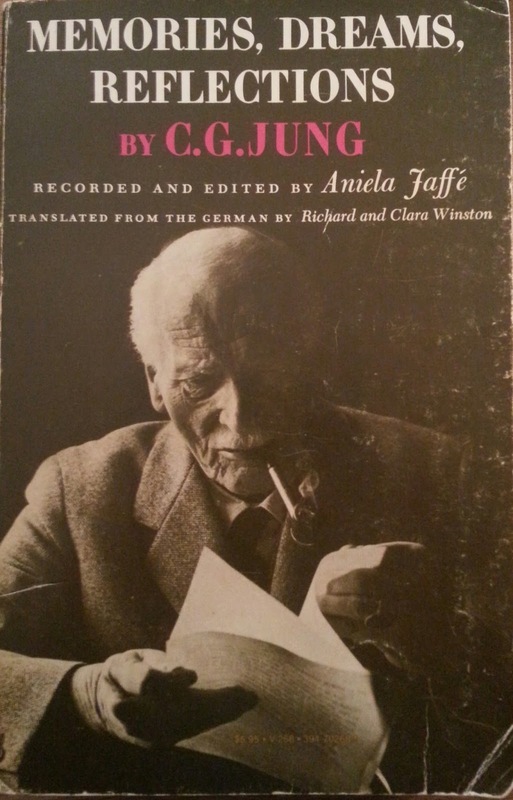 Quotations are from C.G.Jung, Memories, Dreams, Reflections recorded and edited by Aniela Jaffé, translated by Richard and Clara Winston (New York: Vintage Books, 1965). I am using the copy I purchased at a now-defunct bookshop in Albany NY in July 1988, according tom my note on the flyleaf. I have revisited this book, pencil in hand, at least twenty times since then. In the late 1980s, when I moved to a farm in the upper Hudson Valley of New York, I entered a time of psychic storms, transtemporal dramas and shamanic ordeals and initiations comparable to what Jung called his "confrontation with the unconscious." I was possibly not quite as crazy as Jung is now revealed to have been through the pages of his Red Book, but I was out there, and down there, talking to spirits, fighting dead (and living) sorcerers, communing with angels, caught up in the dramas of lives lived centuries before me, and no end of mythic trouble. The difference between the mystic and the madman, it's been said, is that the mystic can swim in waters where the madman drowns. As I learned to swim in deep waters, and to come back without getting the bends, there were books that served as life rings, by helping me to construct models of understanding for what was happening to me and in me. I am going to write about three of them. I read on and on. On an evening of strange patterns in the sky, an area book dealer came bumping up my drive in a pickup truck with something he wanted to sell me. In many cardboard boxes, he had brought me the original first printing, in 73 volumes, of the Jesuit Relations and Allied Documents, a bilingual edition of the reports of the blackrobe missionaries in New France and colonial New York and New England of the customs and shamanic practices of the First Peoples before the American Revolution. The price was steep, but I had to have these. For many nights, they were my preferred reading. Here I found detailed confirmation that shamans are called through dreams and visions and that the heart of their practice is the ability to dream strong, to travel between the worlds at will. The indigenous peoples of the Northeast did not use hallucinogens, and I have never done this either, not needing chemical assistance to travel across time and dimensions. “All their cabins they have filled with dreams," reported a Jesuit missionary, living among the people of an ancient shaman who had called me in night visions. I was first shown Stone, bones and skin by an artist who owned a magical store called Wonderful Things in Malden Bridge, NY, a short drive from my farm. Filled with unusual antiques and tribal artifacts, the store lived up to its name. The owner invited me to dinner to meet Peter Furst and his wife Jill, who had published some extraordinary books of her own on soul in ancient Mexico. When she heard some of my experiences, she cautioned. "Going into this is like hooking yourself up to 100,000 volts." I told her, "I know. But it's already done. The trick now is to ground it." Books and study have always been part of my grounding. Many times, since 1987, I tried to procure my own copy of Stones, bones and skin, only to find it was not available or available only at a prohibitive price. I am glad to report that I found a copy online in the holiday season, and it was waiting for me when I came home at midnight from a trip to the West Coast last night. I am boarding my second flight of the day, from Minneapolis to Seattle. My flight number is 1929, and I am playing with the significance of that number as a year in the timeline of history. The year of the Wall Street Crash and the beginning of the Great Depression, for starters, hmm. When I take my seat, a cheery voice with a Southern accent informs me, through the intercom, that I am on flight 1845. I check my boarding pass. It stillsays 1929. Is the announcer confused? Maybe they'll correct in the next announcement. No, we are reassured, a few minutes later, that we are on flight 1845, still bound for Seattle. And again, "This is Delta flight 1845." I start to play with the idea that time has turned trickster. I have been transported back from 1929 to 1845. Let's see, what happened in 1845? The start of a war between Mexico and the United States. Thoreau moves to Walden Pond. Edgar Allen Poe publishes "The Raven". (I looked some of this up later.) Is there some connection between what happened in 1845 and what happened in 1929, and with the present? I glance to my right. A couple of young Amish or Mennonite women have taken the seats across the aisle. Their hair is closley confined in their gauzy caps, tied under their chins, and their homespun dresses cover their ankles. I feel I have been transported on this plane of reality back a further century, perhaps to the early 1700s. I take up my in-flight reading. I have brought a fresh trade paper edition of The Nature of Personal Reality, a Seth book (channeled by Jane Roberts) that I purchased in a mass market edition on 8.8.88 and started reading then. I found it enormously helpful, together with Seth Speaks and The Education of Oversoul Seven, purchased the same day, in my efforts to find a model of undertanding for the wild and reality-shifting experiences of waking up in the multiverse that were shaking my world that summer. I open the Seth book at random to find him speaking, with fierce clarity, about our need to change our relations with time and sleep in order to wake up to the nature of multidimensional reality. We need to grasp that sleeping for longer than four hours at a time is undesirable and unhealthy, because in sleep, whether we are conscious of this or not, we are traveling outside the body, and to stay away for too long can leave us groggy and (I would add jet-lagged). Seth recommends a main period of no more than four hours sleep, reinforced by a nap somewhere else in the daily cycle. I could not agree more, and remember how confirming it was for me to read this back in 1988, because I have always followed this plan, long before I became fully conscious of why it makes sense, except to the pill-pushers in the sleep meds industry. I look up and the in-flight monitors have gone dark. Then two words come up on the screen: SLEEP TIME. Yes. The games of time on Delta flight 1929 (or 1845) get better and better. The pilot informs us early in the game that our flight time from Minneapolis to Seattle will be precisely 3 hours 52 minutes. Now, this is a "hard time" estimate: time in the air as opposed to the soggier estimates made to cover less predictable things like time on the ground, air traffic delays, taxiing on rinways. Before I see Mount Rainier raising her glorious snowy peak above the clouds, the pilot comes on the intercom again to announce, with wondering excitement, that he has great news of us. We have gained an hour. Flight time will be only 2 hours 52 minutes. There is no obvious explanation for how we are coming in an hour early on a relatively short flight, no strong tail wind, for example, We are among the games of time. All of which is trilling for me, since I am on my way to lead a new adventure titled "Time Travel and Reality Creation" at magical Mosswood Hollow, one of my favorite retreat centers, out in the foothills of the Cascades. At baggage claim, where my suitcase joins the carousel immediately, my flight number is once again 1929. On the drive to Mosswood Hollow, I tell my host, Paul Martin, about this entertaining sequence. We stop at the Safeway in Duvall because I like to treat workshop participants to a little wine with our splendid dinners, if it is their pleasure. My bill at the cash register is precisely $111.11. A Chinese man behind beams and gives me two thumbs up. "Good luck," he chortles. "Very good luck." I feel the same. I gladly hand over 111.11 and give thanks that the worlds are playing nicely with each other today. A tremendous dark figure with a helmet-hat and a long heavy flared coat of animal skins and furs, hung with metal charms and mirrors and weapons, and high fur-lined boots. He is facing me, but the sourceless light is behind him so I don’t see his features clearly. He is more of a silhouette, red-black. I feel a great wind stirring across distant plains. His landscape, his storm, his wind of soul. I am excited that a window between us has opened. He is looking in at me from across time and dimensions. I think of Genghis Khan, the shaman warrior who made an empire, a monster in the memory and jokes of the West, but a hero and exemplar in Mongolia. There is a link between me and this warrior shaman who stands at a threshold between our worlds. There are times when I have been on the other side of that opening, in a different body, and worn an outfit like that. I feel a mute invitation to join this figure now. Maybe we are both avatars of a central self. If I can join him in his world, can our energies work together in mine? What would than mean? All these thoughts and feelings stream through me as I contemplate the figure between the worlds. It is an absolutely spontaneous vision. I did not set an intention for my night dreams, and my body was fast asleep when this figure appeared. When I woke from this dream at 1:00 a.m., after two hours sleep, I was charged with excitement. My mind ranged over earlier adventures in which I have found myself in the world of shamans and khans of Central Asia. When I was a boy in high school, my visions of an ancient warlord of China led me to write a whole cycle of poems. In a dream from a couple of years ago, I found myself in the body and perspective of a man in clothes like this, seated at the edge of a precipice watching a battle unfold in a great plain below, sending out his instructions mentally more than by couriers. The memory that rises up strongest now is from the early summer of 1988, when I was studying shamanism and trying to make sense of a series of psychospiritual storms and trans-temporal dramas that were pushing me towards reinventing my life and my work. In this dream, I visit a tailor and a fancy men's clothing store, looking for a new suit. I decide to try on a pinstriped “power suit” but as I feel the fabric I discover it is made of skins and furs, and is hung with metal charms. I look at the label and see that it reads“Shamanic”. Action: Watch again the excellent film "Mongol", with Tadanobu Asana cast as Temudjin, the young Genghis Khan. We see the ordeals of the young Mongol's life, his shamanic relationship with the wolf, and his reverence for the sky god Tengri. Oh, yes. I will avoid any tendency to act like Genghis Khan! Except in showing respect for the religions of all peoples (he studied all religions and decreed religious tolerance in his empire) and for the spirits of earth and sky. "Genghis Khan at the threshold between the worlds". Drawing by Robert Moss. January 10, 2013.
to the UFO believer in the hypnotist's chair. better than I do, since it's the one inside. I'll feel it kicking. I'll push hard. who wants to come into the world through me. - I discovered this poem in one of the journals I am revisiting. I wrote it on January 13, 1997, when I was at work on two books, published as The Interpreter (a novel) and Dreamgates, still perhaps the most radical of my books about adventures in consciousness (until the new one is born). The line about the "UFO believer" in the hypnotist's chair was inspired by my critical reading, at that time, of John Mack's book Abduction; my response to Mack is in my chapter "Alien Encounters and Spirit Callings" in Dreamgates. The poem speaks to my current condition as a pregnant author, and to the way I feel the book inside me now is growing. I just edited the original version. We need to commit poetry, afresh, every day! My first collection of poems and stories, Here, Everything Is Dreaming, will be published by Excelsior Editions (State University of New York Press) in April. Now, I am well aware that very often I am playing the role of teacher in my own dreams, with many difference audiences: with people I recognize, with people I will meet in the future, with people in countries I have not yet visited, with people in other orders of reality, including the afterlife and what I like to call the imaginal realm. I have received hundreds of reports from people who say they have attended a workshop, a lecture, a ritual or some other type of training with me in dreams. I have learned to pay close attention to reports about Dream Robert's teaching activities, because sometimes I find that he is more than a few steps ahead of me. It's a rare student of mine who brings detailed notes back from the dreaming, but I am open to more! I have two well-read, elegantly dressed male visitors, perhaps from Buenos Aires. Among the books they have with them is a blue-jacketed volume titled H.G.Wells on Time Travel. I realize I have this on my own shelves, though I haven't looked at it in a long time and possibly never read it closely. I get down my copy, and find curious things interleaved with the pages. A tiny dress, folded into a neat triangle. The dress is lacy and pretty. Does it belong to a very small girl, or to the doll I also find pressed among the pages? The doll has long curly fair hair and is wearing a different dress. Where did these come from? I set them out on a child-sized writing table. Feelings: Curious and excited. Also annoyed that noises from the street ripped me from my dreams before I had completed my adventures. Reality: I last read Wells' The Time Machine in 2006 or 2007, when researching a chapter about Churchill for my Secret History of Dreaming. Wells wrote other things about time travel, including the early story "The Chronic Argonauts" from which he developed The Time Machine as a serial novel. Despite their political differences, Churchill was a great admirer of Wells and valued the prescience of his science fiction stories, which frequently previewed future events and technologies. He especially liked The Time Machine and told his physician in 1947 (when he was very ill and conscious of his own mortality) that he would take a copy of the novel with him into Purgatory. Are the tiny dress and the tiny doll connected with the tiny, elegant but terminally effete Eloi in the future world Wells' Time Traveler visits? Or with a different trans-temporal story, maybe one of my own? Is the doll a part of soul, or a clue to soul identity that will be discovered and reclaimed in a journey across time?. The bookish visitors from Buenos Aires make me think of Borges and his friend and collaborator Adolfo Bioy Casares, another great Argentine writer of fantastic tales. Borges' interest in time travel extended to exploring parallel event tracks in parallel universes, as in "The Garden of Forking Paths" and he read and appreciated H.G. Wells; he credited Wells for inspiring his own celebrated short story "The Aleph". I am leading an adventurous new workshop titled "Time Travel and Reality Creation" near Seattle next weekend, so my dream is rather timely. Action: Dreams set us research assignments! Look for a book like the one on my dream, which is an anthology and may contain essays on Wells as well as selections from his own writings. See if I can reenter the dream, identify the little girl whose things are inside the book, and interview the visitors from Buenos Aires. Feedback: Early feedback on this dream is giving me further interesting leads. A dear friend recalls 1940s-style paper dolls she used to dress and play with as a small girl and how she would use them and their paper clothes as bookmarks. Being a boy, I may not have recognized exactly what I was looking at. After mentioning the paper dolls, she dug up some papers I had sent to her while working on The Secret History of Dreaming. 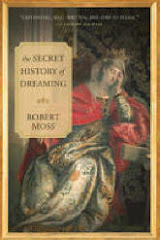 These include detailed reports on the importance of dreams in the writings of H.G.Wells, and how he moved beyond the linear technology-based model of The Time Machine to describe in later stories (like "A Dream of Armageddon") how dreaming is the key to time travel and gives half-awakened individuals the ambivalent power to make choices about where in time they will place their focus and their identity. I had quite forgotten that I wrote these papers. I did not draw from them in my Secret History. So, as in my dream, I was guided to something I had in my personal library, something on "H.G.Wells on Time Travel" written by none other than myself. "When I open the tap, what comes out of my pipes is pure fire." I make up this line at a literary gathering in a big city where a woman writer has asked everyone to come up with a new line on the spur of the moment. While others have clearly prepared or are quoting something already written, my line is fresh and unexpected. It generates a stir of almost sexual excitement in the room. The only person who does not seem turned on is a cerebral man sitting to my right. He's a regular in this group, and seems to feel threatened by my presence and performance. He tries to improvise from my lead, but this falls flat. As the game moves on, he mutters something about needing to head off colds, or the cold. I realize he has a pretty bad cold as he dabs his nose and mouth with a wad of tissues. This is a scene from my dreams overnight. I woke cheerful and confident at 4:00 a.m, ready to go back to work on my new book. Reality check: in the current cold spell, the pipes in my house are more at risk of ending in ice than fire. But I don't think the dream is about that. Yes, I know Freudians would have a field day with this dream, especially if I included a pendant scene in which I am kissing a beautiful young woman in a department store. There is certainly a sexual charge to the dream, but then creativity and real magic ride on sexual energy. I'll be speaking to new groups this year with readings for my new collection of poems and stories, Here, Everything Is Dreaming and it is certainly possible I'll run into someone like the man with the cold, and I'll try to make sure that people like this - in the world or inside me - don't dampen my creative fire! I love improv, and winging it. I lead many games like the one we are playing in the group in this dream, and often I'll have everyone sing a song that has become our hymn to spontaneity: "Make It Up as You Go Along". My bumper sticker (also my action plan): Open the tap and let it all out! No, this is not the effect of holiday cheer. I am pregnant, with a book. For those of you who are unfamiliar with this condition, or have never suffered its effects on a person close to you, let me offer the following counsel. An author with a book that is still inside him is a lot like a pregnant mother - mood swings, odd cravings, bouts of morning sickness. I have never thought that authors merit undue respect, let alone reverence, but those near them need to exercise some care. Give the author space when he needs it. Don't take his flare-ups or silences too personally. Above all, don't ask him how things are going or whether he met his quota today; let him tell you if he chooses. I would like to go swimming, but the day is too cold (I think) to swim in an outdoor pool or in the nearby ocean. I am surprised that two nuns are swimming. One is dressed in a regular (conservative) swimsuit, the other in a gray habit, complete with the headpiece. I’m amazed to see the nun in the habit swimming steady laps, up and down. She looks quite lovely, young and lively and strong, capable of going great distances. Reality: A dear friend, a Dominican Sister of Peace, was with us on New Year's Eve. She does not wear a habit. Though the dream may partly reflect things from her life, my main thought is that it is speaking to me about salutary habits as I embark on my new book project. Bumper sticker: Slow and steady and modest can be a good habit. Further thoughts: Swimming is also a good habit, and I have compared the process of writing a book to swimming the Australian crawl, staying low in the water, minimizing resistance. After first making this analogy, I was delighted to find that the American poet William Stafford developed the same theme in an essay titled "Writing the Australian Crawl."